TVPaint Animation offers some effects which require the use of an image or footage other than the current image. These are referred to as source images or footages. Several choices are available for the so-called source images or video footage: the project of your choice, the layer of your choice, the current brush or animated brush, the spare image, the paper, the current display, the FX stack. * The choice FX stack will use the current image with the effects of the FX stack applied as Source Image before applying the parameters set for the Source Image. * The choice Current layer allows you to apply the effect from the current layer. * The choice Display allows you to apply on the current layer the effect from the footage viewed when playing your project (the effect will be that all layers appear to be merged, while the hidden layers are not taken into account). * You may also choose to use the Spare Image or Paper if they are available. * When choosing another project, layer or brush, you may adjust the Pre- and Post-Behavior, the position and the animation mode: the number "n" of the Offset parameter corresponds to the image "n" of your project, animation layer or animated brush. 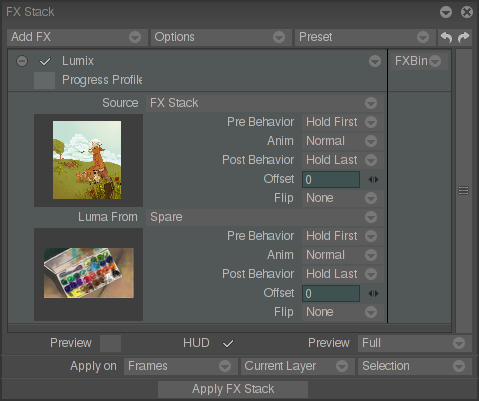 The Animation mode controls the "behavior" of your brush, layer or project: random animation, ping-pong, animation reduced to the image indicated in the position parameter, etc. If the number of source images is lower than the number of images to which your effects are applied, you may adjust the Pre- and Post-Behavior for your source (random, pingpong, loop, etc.). As required, you may choose to flip your source vertically, horizontally or both, before using this source.